Sometimes profound tectonic shifts in the global politics arise from least noticed events. Such is the situation with Iran and the recent visit to Teheran of China’s President Xi Jinping. What emerged from the talks confirms that the vital third leg of what will become a genuine Eurasian Golden Triangle, of nations committed to peaceful economic development, is now in place. Now Iran, Russia and China have all indicated a will to cooperate that has the potential to change the current Western course of wars and destruction in favor of peace and cooperation. Consider some aspects of recent events since lifting of economic sanctions on Teheran only days ago. The content of that cooperation is of a major geopolitical and geo-economical importance for not merely Eurasia, but for the world. Iran has just formally requested to join the world’s most important infrastructure project, China’s One Belt, One Road initiative, often called the New Silk Road Economic Initiative. The New Silk Road initiative was first proposed during a September 2013 meeting in Astana between Xi and Nursultan Nazarbayev, the President of Kazakhstan. Kazakhstan today is also a member with Russia of the Eurasian Economic Union and also of the Shanghai Cooperation Organization. Keep these various threads of an evolving economic fiber in mind as we proceed. Since that initial 2013 discussion in Astana, the One Belt, One Road has begun to transform the political and economic map of all Eurasia. Last year in talks in Moscow just prior to the May 9 Russian Victory Day celebrations, where Xi was a specially honored guest, Vladimir Putin announced that the Eurasian Economic Union–Russia, Belarus, Kazakhstan, Armenia and Kyrgyzstan–will formally integrate its own infrastructure development with China’s New Economic Silk Road. Now the formal addition of Iran to the expanding Eurasian Silk Road is a giant positive step. It will allow Iran to break years of economic isolation and Western sanctions, and to do so over land where NATO color revolutions and other shenanigans are rendered largely impotent. It will open for the rest of Eurasia, especially China, but also Russia, vast new economic potentials. Iran has a young, educated population of more than 80 million, more than half under 35 years old, and a strategic land expanse twice the size of the state of Texas. It has the ninth highest literacy rate in the world–82% of the adult population, and 97% among young adults between 15 and 24 without gender discrepancy. Iran has 92 universities, 512 online University branches, and 56 research and technology institutes around the country with almost four million university students, one million of them medical students. One third or 31% are studying in Engineering and construction programs, one of the highest rates in the world. Iran today is not the primitive backwater many American policymakers imagine it to be. I’ve witnessed that first hand. The country has also been blessed with vast undeveloped economic resources, not only its huge reserves of oil and natural gas. It is situated adjacent to Armenia and Azerbaijan on the north, Afghanistan and Pakistan on the east, and Iraq and Turkey on the west. The Persian Gulf and the Gulf of Oman lie south, and the Caspian Sea—the largest inland body of water in the world—lies to the north, giving Iran most of the water needed for its agriculture. In terms of other natural resources it has one of the world’s largest copper reserves, as well as bauxite, coal, iron ore, lead, and zinc. Iran also has valuable deposits of aluminum, chromite, gold, manganese, silver, tin, and tungsten, as well as various gemstones, such as amber, agate, lapis lazuli, and turquoise. It’s a beautiful, rich country, as I can personally attest. Now, by connecting the country to the expanding network of high-speed rail infrastructure in Eurasia’s One Belt, One Road, Iran’s future will become firmly tied to the most vibrant economic space on the planet–Eurasia–from the Pacific to India to Russia and, whenever the EU decides to stop being suicidal vassals to a Washington gone mad, also to Europe. Notably, the peaceful economic relations between Iran and China go back some 2,000 years, when Persia was a key part of the ancient Silk Road trade route from China to the west. That fact was underscored by President XI. For the past six years, China has been Iran’s largest trading partner, which, despite western sanctions, reached $52 billion in 2014. That is now set to vastly increase, as Western sanctions are gone. There are some who have speculated in recent months that, with US sanctions now lifted, Iran will become a pawn of Washington geopolitical games. While the Obama Administration clearly would relish the prospect, it will not happen. A recent event that has been covered up in Western, especially USA media coverage, illustrates Iran’s clear intent to defend its autonomy and sovereignty, much as her allies China and Russia do, all to the chagrin of NATO and the Pentagon. In early January Iran seized two US Navy small ships that had violated its territorial waters in the Persian Gulf. They were captured and boarded and the 10 sailors on board taken into custody before being released, unharmed, allowed to continue their journey in their own boats. Their boats had “wandered” into Iranian territorial waters around Farsi Island. The loss of all communication equipment and GPS systems on two US Navy boats at the same time means one thing: Iran has developed highly sophisticated electronic means to blind the GPS guidance systems essential to all operations of the world’s most powerful navy. Iran is no ox cart technology culture. In cooperation with Russia and Syria in the war to defeat ISIS, Iran has demonstrated it is no push-over as was Saddam Hussein’s Iraq in 2003. And, despite years of US sanctions, Iran today in military terms is not comparable to Iran during the US-instigated Iran-Iraq war in the 1980’s. The recent incident recalls the event on December 4, 2011 when a US a Lockheed Martin RQ-170 Sentinel spy drone, the premier spy drone in the US fleet, crashed into the Iranian countryside. Iran claimed its electronic warfare unit brought the plane down. Washington laughed. Iran was right. They didn’t just down the aircraft, they took control of it mid-flight: “Using its knowledge of the frequency Iran initiated its ‘electronic ambush’ by jamming the bird’s communications frequencies, forcing it into auto-pilot. By putting noise [jamming] on the communications, you force the bird into autopilot. This is where the bird loses its brain.’” Iran managed to guide the drone to a peaceful landing inside Iran with the drone “believing” it was Afghanistan. This most recent Iranian capture of two US Navy boats well in Iranian waters by sophisticated electronic jamming says that Iran is hardly bowing before the temple of Washington power. She has become a very formidable military force. This ability for self-defense is very important in today’s hostile world. Now, with Iran a formal partner in the Eurasian New Silk Road infrastructure development, and with US sanctions finally lifted, Iran will certainly be formally admitted as a full member of the Shanghai Cooperation Organization at their next annual meeting this summer. Iran currently has SCO Observer status. Presently SCO members include China, Russia, Kazakhstan, Kyrgyzstan, Tajikistan, Uzbekistan and most recently, India and Pakistan. In coming months the SCO, if present dynamics continue, will form the seed crystal of an emerging unified Eurasia, cooperating economically, politically, and importantly, militarily, as well as in counter-terrorism. It will tend to become the forum where vital issues among all SCO member nations will be worked out, as the Chinese are fond of saying, on a “win-win” manner. We’re seeing the emergence of a true Eurasian Golden Triangle with China, Russia and Iran as the three key points. 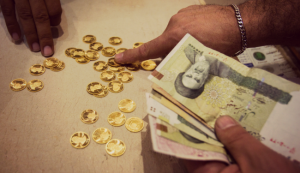 With the stated plan to route the Silk Road rail infrastructure to assist the mining of new gold for currency backing of the Eurasian member states, including now Iran with its significant own unexploited gold, the hyper-inflated, debt-bloated dollar system is gaining a formidable positive alternative, one committed to peace and development. Isn’t that a nice prospect?